There are many methods of wort aeration employed by homebrewers. Brewers who use a counterflow or plate chiller may have an in-line aeration stone. This aeration stone can bubble air — pushed through a HEPA filter by an aquarium pump — into the wort. The aeration stone can also be connected to an oxygen tank. If using an aquarium pump, let the air flow for the entire time the chilled wort is flowing passed the stone. 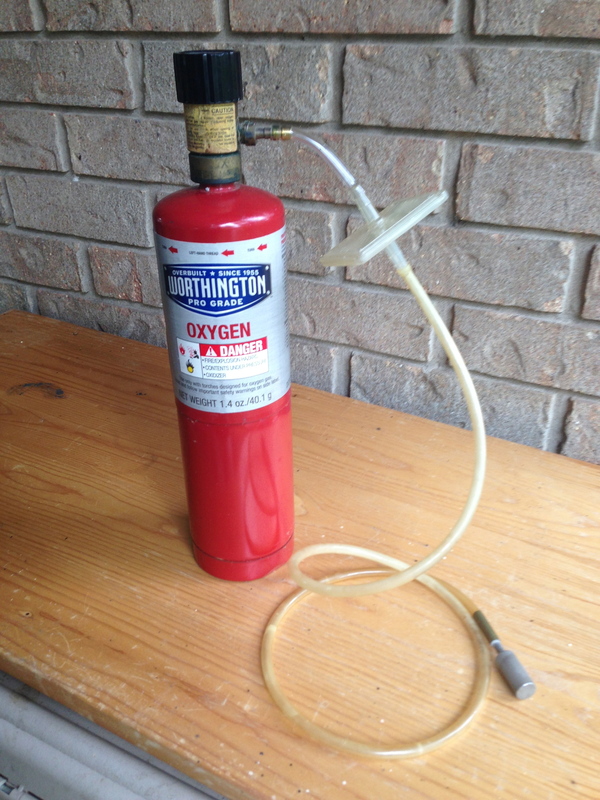 If using oxygen, you may need to intermittently turn the gas off so that the wort does not become over oxygenated. If you are not aerating the wort as it flows into your fermenter, you will need to aerate it in the fermenter. The most effective way to do this is using an aeration stone connected to either an aquarium pump or oxygen tank, with a HEPA filter between the two to filter potential contaminants out of the air or gas stream. In most cases, aerating the wort for five minutes with air or one minute with oxygen will give the yeast a sufficient amount of oxygen. However, there are many variables involved, including the dimensions and pore size of the aeration stone, rate of airflow, and temperature of the wort. The two most common pore sizes in homebrew aeration stones — which are really made of stainless steel, not rock — are 0.5 and 2 microns. Although dissolved oxygen (DO) meters are coming down in price, they are not commonly used by homebrewers. If you do have a DO meter, most yeast strains perform best in wort aerated to 8 to 10 ppm of oxygen. For most homebrewers, however, determining if your aeration is sufficient is based on the fermentation start time. As a rough guide, a well-aerated ale wort, pitched with an optimal amount of yeast, and held at typical ale fermentation temperatures, should show signs of fermentation within 12 hours — and many times, it can be sooner than this. If it takes between 12 and 24 hours for your fermentation to start, you probably either pitched less than an optimal amount of yeast or did not fully aerate the wort. Still, you were in the right ballpark and will still likely have an ordered fermentation. If your typical waiting time until fermentation starts exceeds 24 hours, you should consider pitching more yeast and aerating better. There are other methods of aerating wort that homebrewers employ. These include splashing the wort into the fermenter, shaking the fermenter, pouring the wort through a mesh — such as a strainer in a funnel — and using drill-driven paint stirrers to whip the wort. If an adequate amount of yeast is pitched, these methods are frequently sufficient to produce an ordered fermentation. And, the amount of foam raised gives some indication of the amount of air introduced into the wort. Generally, the brewer will aerate the wort once, and then pitch his or her yeast. In some cases, however, more than one shot of aeration may be beneficial. When brewing a very strong beer, a second shot of aeration — before high kräusen has occurred — can help the yeast. There is a risk, though. Adding oxygen to fermenting wort leads there being more diacetyl produced. If you add oxygen before high kräusen, in a big beer that will be conditioned awhile, the yeast will likely be able to take up the excess diacetyl by the time the beer has matured. If you add oxygen after high kräusen, the yeast may not have the number of active cells (or vigor) to reabsorb all of it. On Friday, this all-grain brew day walkthrough will conclude with a discussion of pitching. I had an O2 aeration system, but after trying a MixStir I sold it. I got equally good results with the MixStir with less expense and hassle. YMMV. What about using a whisk? Why is conventional wisdom so myopic? There are many methods of aeration. As I explicitly said, I wasn’t going to discuss them all. Additionally, some brewers pour their wort back and forth between two buckets, others let the wort fan down the side of the fermenter as they fill it. Picked the best methods — injecting sterile filtered air or oxygen into the wort — and mentioned some of the more common variants (that add unfiltered air) into the wort. Agreed…there are many methods of aeration; however…the article overlooks some of the easiest…simplest… and effective methods which leaves the impression the process is more complicated than it really is. FermentOrs are the vessels where the yeast work. It’s not a mistake according to “Dictionary of Beer & Brewing” (1998, Brewers Publications).